Learning Support Educators working in the government’s learning centres are arriving home from work “bruised and battered”, the Union for Professional Educators has claimed. According to its president, Graham Sansone, the union had received complaints from members who were having to endure bruises, bites and “other visible injuries”. Battered and bruised… one LSE’s injuries. The union president said that it had advised its members to take photos of their injuries so that it could compile data on the matter. Mr Sansone said that he was also questioning the safety of the restraining techniques that were currently being used with the children. “The union is aware that no courses have been forthcoming with regards to such techniques thus leaving LSEs helpless during full-blown tantrums by the mentioned students, apart from the fact that there is a potential risk that such students might get injured in the process. 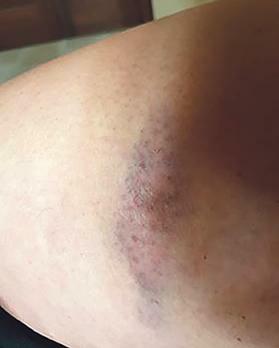 “This issue was already highlighted a few months ago with the Department of Education,” Mr Sansone said, adding that LSEs should send any photos of their injuries as these would then be used during a meeting with the Education Ministry taking place in the coming days. Contacted by this newspaper, the Malta Union of Teachers president Marco Bonnici said that the MUT had always directed its members, both those in mainstream classes as well as those at centres, to refrain from applying “unapproved restraining techniques” as they would not be covered by the union if an incident was to occur. According to Mr Bonnici, some techniques were not recognised in the field and there had also been instances in the past when one particular centre was stopped by the education authorities from applying such techniques. He did not divulge any details on which centre this was or what the techniques were. “Members are always advised to notify the respective head and the MUT in such cases so that they take the necessary measures. The MUT receives weekly reports about difficulties being faced and these are flagged immediately with educational authorities. “The MUT affirms that no employee can go to work to suffer bites and bruises and will continue to make its strong position on the matter,” Mr Bonnici said. Questions sent to the Education Ministry earlier this week remained unanswered by the time of writing.